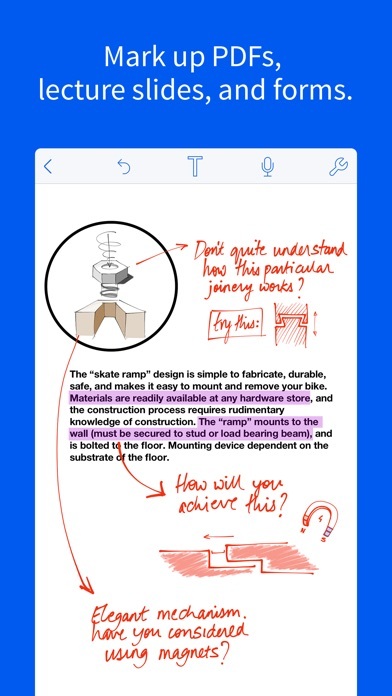 Welcome to Notability: powerful, yet wonderfully simple note-taking and PDF annotation. Apple Editors' Choice on iPad, iPhone, and Mac! Top selling paid app on iPad App Store, regularly ranked #1. 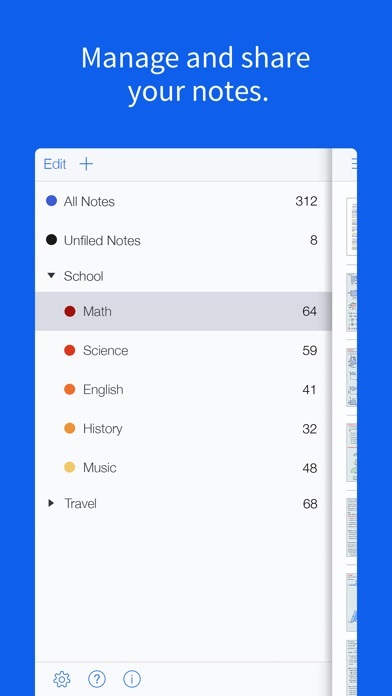 Students, teachers, and business professionals use Notability daily to enrich their lives. It is uniquely designed for each device to provide the best note-taking experience at school, home, and work. STREAMLINE YOUR WORKFLOW • Become fully paper-free, in the classroom, office, and at home. 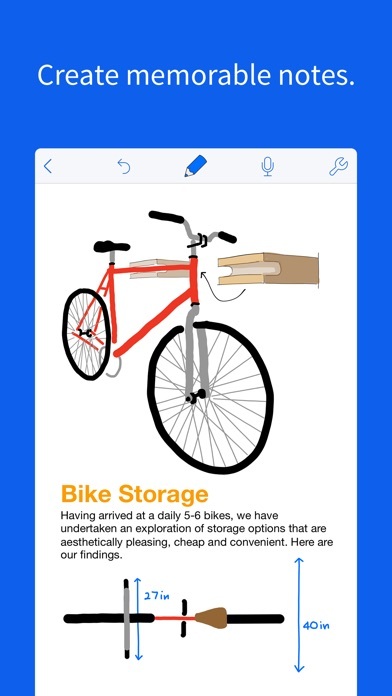 • Complete, sign, and share documents in Notability. • Drag and Drop to move files, text, photos, GIFs, web pages, and more from other apps into Notability with Multitasking. • Secure and lock your notes using Face ID and Touch ID. HANDWRITE AND SKETCH WITH BEAUTIFUL INK • Fully express your artistic side with custom colors and match any color with the color dropper. • Easily create perfect circles and straight lines. • Ink is fine-tuned for 1st and 2nd generation Apple Pencil for the most responsive, precise writing experience yet, including double-tap gesture for switching tools, erasing, and more. SEARCH AND CONVERT HANDWRITTEN NOTES • Search for handwritten words from the Library and in the note view in any of our 15 supported languages. • Convert handwriting to text. • It all happens on your device, so your information stays private. SAVE TIME WITH MULTI-NOTE • Multi-Note lets you work with two notes side-by-side. • Quickly switch between notes with the Note Switcher. 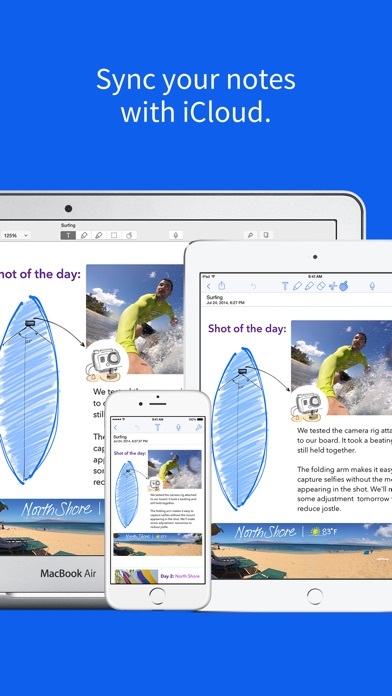 • Drag & Drop handwriting, typed text, images, and more between notes. TYPE ANYWHERE • Notability includes full-featured, left-aligned typing with word count and a wide range of fonts, sizes, and colors. • Create outlines, interactive checklists, and text boxes. • Save time with keyboard shortcuts. IMPORT AND SHARE • Import PDFs, DOCs, PPTs, images, GIFs, and more - conversion to PDF happens on your device, so your information stays private. • Annotate imported pictures, lecture slides, and meeting agendas, or complete class assignments. • Share notes via email, AirDrop, Dropbox, Google Drive, Box, OneDrive, and more, or share note content to other apps with Drag and Drop. RECORD AND PLAYBACK AUDIO • Get more out of your lectures and meetings when you record them. • Notes are automatically synced with audio recordings so during playback you can listen to what was happening as you wrote. AUTO-BACKUP AND ICLOUD SYNC • Use iCloud to automatically sync your notes to Notability on iPad, iPhone, and Mac, or to retrieve previous versions of your notes. • Use Auto-backup to send your notes to a cloud service for archiving or recovery. Dropbox, Google Drive, Box, WebDAV, and OneDrive are all supported! Mac app sold separately. Notability is a registered trademark of Ginger Labs, Inc. All-time, top-used app for every level of student! 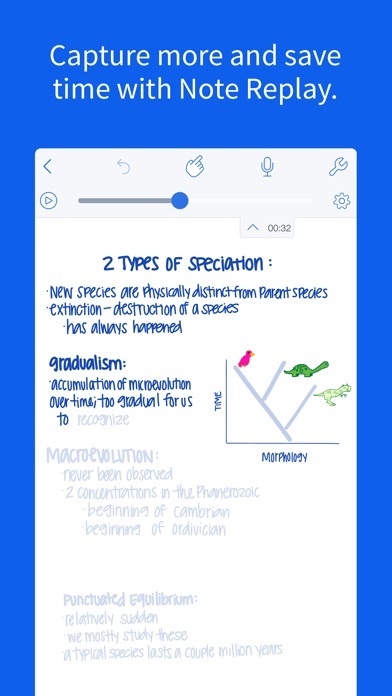 I began using Notability in either 2011 or 2012 for note-taking in my college lecture, and fell in love with the free version of this app, fairly quickly. I don’t recall exactly when I decided to splurge on the pro edition of this app, but it is without a doubt, the only app I have ever felt as though I was blessed to be able to find, use, and pay such an affordable price for such a powerhouse of a tool.I paid $20 for it when i downloaded the full, pro, lifetime version(an unbelievable deal, which should be consistent across all platforms of apps, i mean really!). I can tell you that since purchasing this app, there is not once that I have been using it without someone approaching me to compliment how cool and easy and smooth it looks, (and to ask about 5-10 follow up questions.) Additionally, you’ll find that while some apps you are using around people will draw a question or notice of some sort, you rarely find yourself being asked so thoroughly about an app, that you may as well start billing them for royalty checks, or at least some type of in depth app orientation seminar, HA! Us University STEM students are serious about the educational tools we use, and I have yet to find another app which is so impressive across the board. I am in a senior obtaining my chemistry degree, and I take notes or use this app for 6-10 hours, every single day. Since deciding after a couple bad auto accidents that I could no longer lug nearly 40 pounds that WAS my book-bag across campus for at least 2 miles a day, and I have to say I don’t know how I ever managed such schlepping for so many years before this. My life has changed as a result in a few cool ways: my daily pain from daily weight training with my book-bag has gone to NIL, I no longer struggle to locate any notes, nor do I find notes littered all about my car, backpack, room, etc. The pro version, which syncs across all my devices, iPad, iPhone, and MacBook pro (seamlessly and without even one single issue, backup related, or otherwise for that matter) that has ever come up with this app. I think the one time I can even recall having something which resembles an ios issue to me, is when i was running enough apps, and programs across all apps, that i should have been using an iMac with 8 gb of ram and an SSD, rather than doing all those activities simultaneously on my 2018 iPad 9.7”, with the lesser amount of memory. In my opinion, it was an error on part of my iPad being unable to handle the capacity of memory i was using ALL at once, and therefore not an issue on Notability’s part. This long overdue, and completely SELF-MOTIVATED review/rating, was inspired solely by the commitment and dedication of the Ginger Labs Team, who for nearly 10 years has brought innovation and excellence to their audiences in the form of this life changing app. Your hard work, and constant upkeep of this app does not go unnoticed, so at 2 am on a school night, I took a break from my research presentation to express my gratitude. Keep up the amazing work, it is evident that Ginger Labs has one of the strongest teams working in tech industry today, as you guys have figured out a lot of the difficult, glitchy, technical, and SUPER important details that many other app developers have yet to crack/attempt a fix. Details like being able to send your notes across devices, across apps, in readable and universal formats, i mean come on ONE NOTE get with it. I don’t know why some of my friends are die hard one note users but....oh wait, its because you have a Microsoft surface. I guess if i had one note(no pun intended), it would be for Notability to make their app universal for all non-iOS devices. I mean I don’t need it, and thus I do not care, but it is probably already a goal on your team’s to-to-list, and I also think it would help those stubborn surface users to finally give up on their beloved spiritual obsession with onenote. LOVE YOU GUYS! Top notes app. Worth the price. Needs speed. (Based on beta) TouchID for lock, superb PDF handling, superb handwriting/sketching, with ease of highlighting existing text. Great file transforms and OCR. Quick and subtle audio recording. Unlike notes.app: discrete title (this may not mean much to but a few of us) I’d like to see timed reminders. I’d like to see better cross-platform font-size handling. Just one major gripe. Very slow to load from scratch! (After scratch, *for awhile*, it pops right up.) The test for speed: I tested both Notes and Noteability in the same manner. For each, I used the stopwatch on my iPhone and the app on my iPad (Mini 4, iOS 12.2). Each time, I pressed double-Home and swiped ALL apps up and out. Then I held Power and Home until the Apple appeared and rebooted the iPad. Then I started the app from scratch. Times from icon touch until the app was usable: Noteability: 6.97 seconds Notes: 3.43 seconds (I won’t delve into other apps which were even faster, some near instantaneous.) Noteability needs speed. This App has served me well for years. Recently, three notes that I spent hours on came up entirely blank immediately after closing out of them. I will not use Notability until I can be assured this will not happen again. I suspect it has something to do with iCloud syncing. The app is very good for handwriting, there is no complaint about most services that notability provides. However, there are a few revision that I think notability could consider. 1. Add the ability for users to alter the orientation of the notes. This is because that when PDFs are imported, many of them are oriented in the wrong direction for reading. However, users can’t alter them inside the notability app, which means that users have to use another app to do so. This is very inefficient, and the fact that not many note taking apps can do this means that notability will get a head start advantage. 2. Consider adding the ability to split screen in the “up and down” direction, not just side by side (or left and right). This design allows note taking in smaller devices on one screen more plausible. Please consider adding the above features!! No one to help me. This app worked great for me until I ran into some issues. I attempted to contact notability for some help but never heard back from them. They seem impossible to contact which is a bummer. I love notability and use it for everything I do, but I just wish I could create folders within folders for projects, Etc. Like i would love to have a year folder with a semester folder inside with a class folder inside with a chapter folder inside. It would also be nice if there were other pen options (Pen, pencil, shading, things like that for when i make diagrams). Otherwise notability is everything I’ve ever wanted for taking notes. Notability fails to render mathematical expressions by inserted equations done in Microsoft Word. I’d give it much better ratings if it wasn’t something so basic that they missed.